Yep. 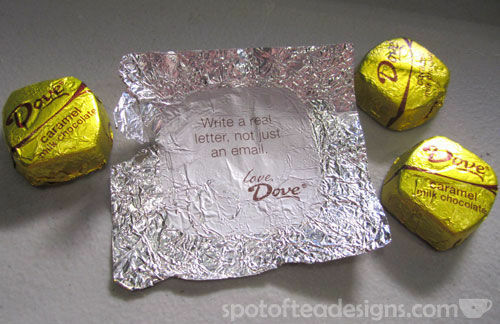 That was the advice on the inside of my Dove Carmel Milk Chocolate Smooth Promises candy I recently opened. While I don’t normally write a real LETTER per say, like a lined sheet of paper, I do make a lot of handmade cards for birthdays, holidays and thank yous. I think that satisfies this advice, right? If you aren’t the crafty type to handmade a card, then why not try sending a Random Act of Mail? This smiley envelope just wants to say hello to a long distant friend! Get off the computer and get a real pen in your hand to send out your own Random Act of Mail today! Year of Date Nights: September I’m Getting Married Today!